Technicians and support personnel were brought together from Regina, 443 (MH) Sqn, 12 Air Maintenance Squadron (12 AMS), 423 Maritime Helicopter Squadron (423 MH Sqn), 450 Tactical Helicopter Squadron, an Aircraft Engineering Officer, Sea Training (Atlantic), as well as Sikorsky representatives. Febuary 6, 2019, aircraft CH148824 (call sign BRONCO) left 443 Maritime Helicopter Squadron (443 MH Sqn) in Patricia Bay, BC, and embarked HMCS Regina from CFB Esquimalt. In a historic milestone for each unit, MARPAC employed a CH-148 Helicopter Air Detachment (HELAIRDET) for the first time and sailed west to fight as one. Embodying new technology like surface surveillance radar, Inverse Synthetic Aperture Radar, sonobuoy processing, electro-optics, electronic warfare, long range active dipping sonar, tactical datalink, and digital recording capabilities, as well as search and rescue and utility capacities, BRONCO’s heightened integration was swiftly embraced, and brings a leap in capability for the Royal Canadian Navy (RCN). After HMCS Regina sailed west from Hawaii, a significant setback occurred during envelope expansion aboard Naval Replenishment Unit (NRU) Asterix. On February 19, under challenging operating conditions, the CH148 experienced a hard landing, and sustained enough damage to require a significant Royal Canadian Air Force (RCAF) response. Technicians and support personnel were brought together from Regina, 443 (MH) Sqn, 12 Air Maintenance Squadron (12 AMS), 423 Maritime Helicopter Squadron (423 MH Sqn), 450 Tactical Helicopter Squadron, an Aircraft Engineering Officer, Sea Training (Atlantic), and Sikorsky representatives. These personnel formed a mobile repair party on the remote island of Guam to cohesively execute around-the-clock repairs. Special thanks to 12 Wing, 14 Wing, Combined Air Operations Centre, and 429 Squadron for their rapid mobility support. From the first day alongside Guam on February 26 until the fully-completed package departed in March, the team’s success can be attributed to individuals’ attitudes and solidarity of purpose. Not only was such focus and determination present amongst RCAF personnel, but our RCN brethren, contractor support staff, and US allies at Helicopter Sea Combat Squadron Two-Five (HSC-25), air mobility personnel at Andersen AFB, and port authorities at Naval Base Guam, who all provided outstanding support to the massive repair effort. 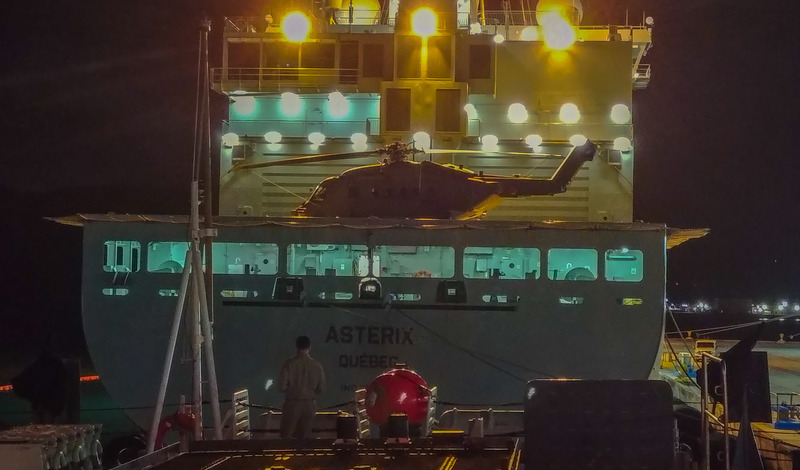 Various inspections and repairs to the helicopters were started on NRU Asterix on February 19, and continued until the ship’s arrival in Guam. A comprehensive damage assessment was also carried out on NRU Asterix during the transit to Guam, which defined the task ahead, but made it no less formidable. During the first several days following the hard landing as the ships made their way towards Guam, Regina had to transfer many parts, tools, and equipment from BRONCO’s home ship over to NRU Asterix to begin working on BRONCO. After arrival in Guam, the Mobile Repair Party from Canada joined the team in Guam with specialised qualifications, authorisations, tools, and parts. During seven days in Guam, the tail pylon was removed and replaced, four main rotor blades were removed, two were re-installed and two were replaced, the left main landing gear was replaced, and repairs to a cracked sponson were carried out by the MRP working around the clock, 24/7. Bravo Zulu to all members involved in the aircraft repair scheme from the contractors, RCAF, RCN and US services. Challenges are bound to arise with any complex piece of equipment, yet Regina’s team has admirably fought through adversity, and looks forward to its planned mission.